Contact Us for a RISK FREE Assessment! Hello. I'm Michael Erkau, Owner/Centre Director of Mathnasium of SW Winnipeg, your neighbourhood math-only learning centre. We help kids in grades 2-12 understand math by teaching the way that makes sense to them. To Schedule a One on One Skills Assessment, Click Below! New Sunday Hours: 12-3 PM! Using proprietary Mathnasium Curriculum, we can pinpoint gaps in knowledge and help your child. Whether they are in Grade 2 working on the fundamentals, or preparing for the Grade 12 Manitoba Provincial exam, we are here to help. I can see a difference in my daughter already in terms of confidence within first month. She enjoys getting a prize every so often. Also like the flexibility of dropping in to fit our schedule. The staff at Mathnasium are very helpful. They took a subject my daughter was struggling with and made it her strongest subject. I would recommend this service to anyone who wants their child to excel at math. I can't tell you how grateful I am to not having any Homework Wars with my child over their math... Mathnasium is heaven-sent... I'm so grateful my child went from a D grade to a very strong and consistent B+ now. They have also received an A on a few test as well. The funny thing is, the teachers were so surprised, because they couldn't explain how my child went from a D gread to an A, that they actually called to ask me what we were doing differently. Mathnasium helped to prepare me for the Provincial Pre-Calculus exam. The tutors were very knowledgeable, helpful, and patient. I looked forward to going to Mathnasium for help. I felt confident when it came time for my exam. I am very happy with my mark on my final exam. Thank you Mathnasium! My two sons have benefited from this program greatly! I value the individual support, the fact that they create an individual plan for each child and that each plan is based on credible assessments. They regularly assess progress. My son went from hating maths to loving it! He has more confidence. The teachers are great there! My daughter is really enjoying attending and it is helping boost her confidence. I wish they would focus more of what she is currently learning at school to help her understand I’m those areas. My daughters math marks are improved in school. She likes the rewards from mathnasium. 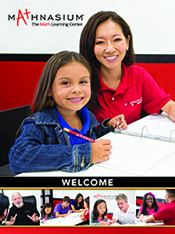 Mathnasium tutors helps my daughter in her high school math and in my son's university math course. We've noticed their grades improve since attending Mathnasium. The tutors are very nice, helpful and approachable. Michael is also very nice. Very helpful staff and fun environment. The kids enjoy working towards a goal and always come out eager to tell us what they’ve accomplished. We are very lucky to choose your school for John.He has been able to speak more english and also he has already begun to like the mathematic.I am so happy to get this result.Thank you for your works. My daughter had her first test after 3 weeks of Mathnasium and received 86%. We are so pleased of the outcome already it has boosted her confidence & wanting to learn. Everyone there helps her in any way they can to understand what she is getting taught at school and the different ways to learn it. Thanks, we wish we found you sooner. We used mathnesium during the summer of 2018. Our daughter immediately felt comfortable and gained so many new skills and clarification. We often refer to things learned from her time at mathnesium. We feel it will be a summer tradition to help her build up readiness for the following year. After only a month at Mathnasium, I've already seen a significant improvement in my daughter's confidence in doing math. She's had a couple of pop quizzes at school and has aced them as well! Our daughter’s math skills and confidence has improved considerably over just 6 months at Mathnasium and math no longer means tears and frustration. Thank you! I took my son to Mathnasium to help him strengthen his math skills as it was the one subject he really struggled with. The program was fantastic and I loved the fact they did their own assessments to hone in on my son's strengths and weakness. From this assessment they designed a program to help my son get caught up with his school work and the staff were fantastic in getting him to understand the concepts. Best of all, my son loved going and I could see his confidence grow. I recommend Mathnasium to anyone! Thanks - we enjoyed helping him! You have explained the Mathnasium program very eloquently. Our son feels much more confident than he did before, and he actually wants to come and continue his lessons! My daughter is excited to go back. She likes the accomplishment of the number of pages she finishes and the spinning of the wheel and rewards. She also likes treat days. My son enjoys doing Maths after the Mathnasium classes. Our experience with Mathnasium was a positive one. Michael was easy to approach and talk to. He was willing to go the extra step, and accommodating in many ways, which we appreciate. Our daughter's confidence and math skills improved as she regularly attended. We are very pleased with the excellent teaching material and format provided by Mathnasium. The teachers are excellent and well liked by our kids. I truly appreciate the flexible hours that Mathnasium offers. Opening on Sunday has made a big difference. We have tried several other tutoring options for math over the years for a few of our children. Mathnasium was by far the most effective and value for the time and money spent. My daughter feels more confident and loves math again! No more homework battles too. Thx Mathnasium. My daughter has been enrolled since August and have had two months with the company. My daughter feels she is making good progress. She enjoys the instructors. My daughter at times requires patience with her ability to focus and has not complained about any of the instructors. One in particular was able to get her humour and wit and has turned a session one evening into a great success by motivating her and somehow turned her session around when it wouldn't of gone anywhere that day. My struggle with Mathemasium comes with its one location being not so accessible easily by bus. Bus service for my daughter is quite the ordeal and makes it difficult to get there on the two days of the week that I work evenings. I find the ours of operation at times hard to accommodate due to the length of time it would take me to drive through rush hour traffic, and often when I wait till after, I loose the 90 min time frame cause its hard to get there on time and your closed at eight. On Saturday it would be so much easier to meet the timings if you were open longer than four hours, closing at 2pm I find very limiting!!! Saturdays, in my opinion should be accessible till at least 4 or 5 Pm. For myself as a working single parent, I find transporting whether driving/bussing to meet the hours of operation to optimize the amount we can attend considering the financial commitment a little difficult. Excellent insruction that has helped our child gain greater confidence in math. My son has been there since it opened. Loves going and has greatly improved at Math. Thank you! Our son has struggled with Math for the past couple of years. The Mathnasium program has motivated and taught him a new appreciation for Math. He looks forward to his time at Mathansium and has learned lots! My son is feeling more confident with his math.. Thank you. Our son became more interested in math and science.Thanks to Mathanasium. My daughter's response is that the instructors are nice and willing to help. My son's response is that instructors explain it so that he can understand. Our girls are always looking forward to coming to Mathnasium. Michael and his staff are very helpful and encouraging and our girls are always feeling more confident after each session. I also like the idea that I get an emailed progress report on how my kids are doing and what goals they are working towards. In the first month our son has drastically increased his marks at school, but more importantly has gained more confidence. He really likes the instructors that have helped him. Strongly recommend! I'm so thankful for Michael and his staff and there ability to create a low stress, friendly environment for learning. My son learned more than math. He gained confidence, over came his fear and was challenged to not give up. Amazing life lessons at a prime age. My daughter for the first time in her life is excited to study . She genuinely looks forward to each session and has taken an active role in scheduling her time to ensure she can get to Mathnasium 2 to 3 times a week . Her increased confidence and maturity as a student are a direct result of the valuable life long math skills she is honing with Michael and his team. We are very happy with the program. Michael is fantastic. My son has made really nice gains in math skills over a 6 month period. Even more than that, his confidence has increased tremendously and he now believes he CAN do math! Our son has worked hard and improved his grades by 20% in 3.5 months. We are so proud of him and grateful to the caring, focused staff. He no longer shuts down when he does math homework. It's changed life for us all and given him the confidence to succeed. I have realized Aedah has improved with her multiplication skills.looking forward to problem solving. overall, i am glad she came to the math learning center.Thanks for all your support. enjoy the holidays. My daughter struggles with math and retention of the concepts. At Mathnasium she gets the help she needs to succeed in Grade 8. My son was happy to attend the sessions and felt more confident in math. He felt the time passed very quickly, which is definitely a good sign. I was very surprised with how engaged my son is in the experience and how positive he is about attending Mathnasium. Mathnasium provided our daughter with a new found confidence in math. She enjoys attending her sessions, and enjoys the learning process. We've been there a month, and it's been great! My daughter asks to go everyday! Staff is friendly and helpful with a positive learning environment. After about the third time with Mathnasium, my daughter tells me that Mathnasium in soooo much better than Partners For Learning. Which she went to for about 5 years. Her marks have not gone up too much yet, but she understands it a lot more now. Teachers are kind,willing to share their talent.and the best thing is they help my daughter a lot,she got higher grade on her report card.thank you guys,keep on teaching.